Ipilimumab is a type of targeted cancer drug called a monoclonal antibody. This type of treatment helps the body's natural defence system (the immune system) to fight cancer cells. Please call at M: +91 9891296838 to know more details about the FDA approved generic Ipilimumab medicine available in India and its cost price. Ipilimumab is indicated for the treatment of unresectable or metastatic melanoma. Active ingredients in brands are: ipilimumab. Inactive ingredients in Brands are: diethylene triamine pentaacetic acid (DTPA), mannitol, polysorbate 80, sodium chloride, tris hydrochloride, and Water for Injection. Where can I buy Ipilimumab Injection? 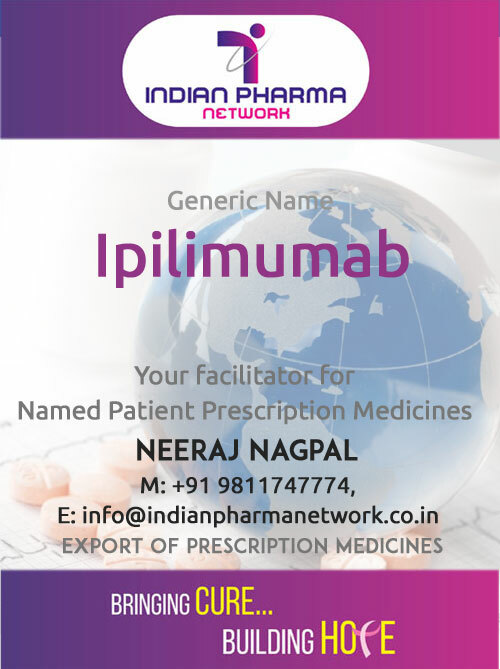 IPN helps patients, doctors and hospitals as a facilitator to import prescription medicine brand Ipilimumab on prescription and Import License in Patient's Name only. For Ipilimumab Injection price in India. Please call at M: +91 9811747774 or Email Us to know more details about the medicine and its cost price in India. For Indian Patients, doctors and hospitals Ipilimumab Injectioncan be made available at Mumbai, Kolkata, Hyderabad, Chennai, Ahmedabad, Delhi, Bangalore, Srinagar, Jammu, Jaipur, Chandigarh, Ludhiana, Noida, Gurgaon, lucknow and Pune and other cities in India. The order will be confirmed only after the receipt of valid prescription of doctor and import permit if applicable. Unresectable or metastatic melanoma: 3 mg/kg administered intravenously over 90 minutes every 3 weeks for a total of 4 doses.